Friends, family, colleagues, the UPS delivery guy -- suddenly everybody is a trove of advice, much of it contradictory and confusing. With dire warnings of what will happen if baby is fed on demand and even more dire warnings of what will happen if he isn't, not to mention hordes of militant "lactivists," cosleeping advocates, and books on what to worry about next, modern parenthood can seem like a minefield. In busy Mom-friendly short essays, Sippy Cups Are Not for Chardonnay delivers the empathetic straight dirt on parenting, tackling everything from Mommy & Me classes ("Your baby doesn't need to be making friends at three months old -- you do! But not with people you'll meet at Mommy & Me") to attachment parenting ("If you're holding your baby 24/7, that's not a baby, that's a tumor"). Stefanie Wilder-Taylor combines practical tips with sidesplitting humor and refreshing honesty, assuring women that they can be good mothers and responsibly make their own choices. 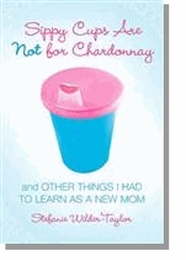 A witty and welcome antidote to trendy parenting texts and scarifying case studies, Sippy Cups Are Not for Chardonnay provides genuine support, encouragement, and indispensable common-sense advice.